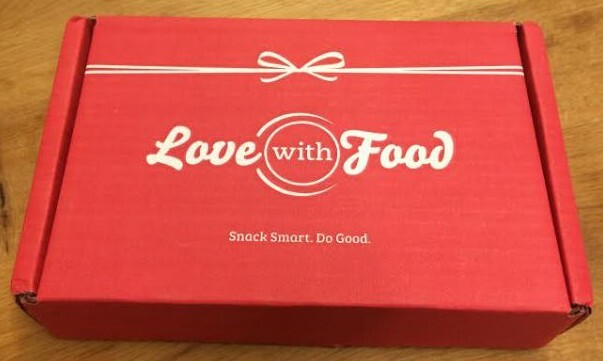 As part of my general addiction to subscription boxes, I’ve ventured into the realm of subscription snack boxes with its most heavily promoted box: Love with Food. This box features a variety of not-too-bad-for-you snacks, both from niche and heavily distributed brands. The monthly subscription is $12, though you can get your first box for a discount by using my referral link (or any other referral link you find). The snacks were all good, and I definitely enjoyed them at the $2. However, the total cost of the snacks included in the box came up to $7 – so I’d have been bummed if I’d paid full price for the box. Needless to say, I unsubscribed, which was a very quick and easy process, though it involved filling out a survey but that was actually a plus, as it gave me the opportunity to tell them why I was cancelling. 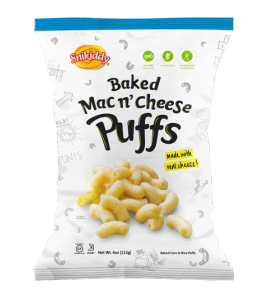 My 12-year old really liked these mac n’ cheese puffs. To me they tasted somewhat citric and not at all cheesy. She felt they tasted like mac & cheese (which I, personally, avoid). Other pluses, non-GMO and gluten free. The main ingredients are corn, rice flower, oil, whey, cheddar cheese and buttermilk. The package had 90 calories. Not a bad snack. These are pretty good, run-of-the-mill kettle chips. 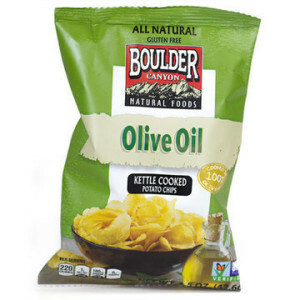 I like that they contain only three ingredients: potatoes, olive oil and salt. And I like that they are not too greasy and not too hard. I think they need more salt, however. They mostly taste like plain chips, with the olive oil only giving them a hint of bitterness. I did quickly finish the whole package (220 calories), but I was pretty much full afterwards. I’d buy them. They are made in the USA and they are available at some supermarkets. This was a pretty tasty bar. I can’t say that it was particularly delicious, and I did find it too sweet, but I enjoyed it. These lemon wafers are delicious. 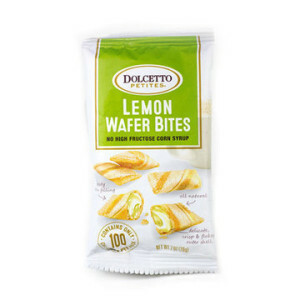 They are crispy wafers, filled with a sweet, lemon-flavored creamy filling, not too unlike those in lemon cookies. They are full of flavor, and much lighter than a cookie. 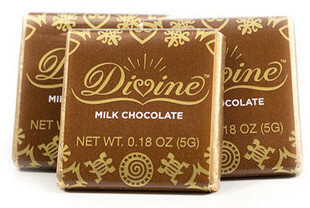 The packages are tiny, but at 100-calories they should satisfy your need for a bit of sugar. They seem to be made in Indonesia, and they have sugar rather than corn syrup. I still haven’t used it. Enough for 1 8-oz cup. Made in the USA. 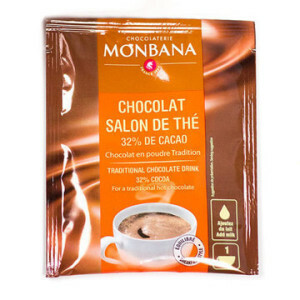 Nice, tasty chocolate. Not exceptional, but a nice little treat. They sell this occasionally at Grocery Outlet. Available at Walmart for less than $3 for a 1 lb jar. The samples are tiny and I can’t imagine I can really try them, but maybe I’ll sprinkle them on something. 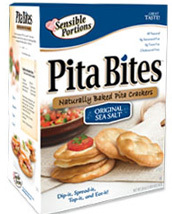 I got a box of Sea Salt flavor Sensible Portions Pita Bites to go with the Rougette Bavarian cream cheese I picked up at Grocery Outlet, and I’m in love with them. The crackers are super crispy without being tough, they taste very fresh (a little over a month before the expiration date) and are very tasty, both by themselves and specially with the cheese. By themselves they are a bit dry, though. They don’t contain any sugars, so they seem to be good for diabetics. The Safeway in downtown San Leandro offers children a free cookie from their bakery. This is a great strategy by Safeway, not only does it create good feeling on parents but it means that kids rae eager to actually go grocery shopping with the parents. Parents shopping with kids are more likely to buy stuff they wouldn’t otherwise. Yesterday, my kids (and I!) got a Safeway Chewy Peanut Butter cookie and I have to say it may very well have been the most delicious cookie I’ve ever had. As promised, it was very chewy, it almost felt like it had caramel inside (but I don’t think it did). The flavor was out of this world, not too sweet, not too peanut butterish, with a chocolate chip here and there to balance the flavor. Even though it was so chewy it did feel a bit dry (a common problem with peanut butter cookies), so I think it’d be best eaten with a cup of milk or coffee. These cookies retail at Safeway for $4.50 for a dozen (I think) – almost twice as much as their “regular” cookies cost (on sale). But as they’re twice as good as their regular cookies, I can’t complain. I just wish they sold them by the unit, as good as they are I can’t expect to buy a box and not eat them all (so I won’t). 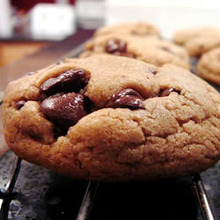 I found a recipe for chewy peanut butter chocolate chip cookies at the Safeway site, I’ll try it and hope it’s the same one they are using. Mika must have had these cookies before, because she knew exactly what they were when she pointed them out at Trader Joe’s. She laughed at the suggestion that they were actually for cats, despite the cat on the label. They are very good and addictive, with a ginger flavor that kicks at the end (how come she likes them?) Not particularly healthy, though. But they do come in comical cat shapes. A Mike invention. It was surprisingly good and it made me long for Chubby Hubby ice cream.